In a more peaceful time, orphans Alla and Marah look out over the city of Homs, Syria. Their orphanage, a ministry of the Syrian Orthodox Church that is supported by MCC’s Global Family program, has now moved to a safer location. Samantha Nutt signs copies of her book Damned Nations: Greed, Guns, Armies & Aid at the Project Ploughshares 35th-anniversary celebration in Waterloo, Ont., last month. The CMU Male Octet performs at the MC Saskatchewan delegate sessions. Indigenous carver Isadore Charters, left, directs Don Klaassen, in the fine art of wood carving. The totem pole will be exhibited at the B.C. Truth and Reconciliation Commission meetings in Vancouver in September 2013, in recognition of the Canadian government’s role in perpetrating harm upon First Nations peoples through residential schools. Marla Langelotz, pastor of Sargent Avenue Mennonite Church, Winnipeg, participates in a table discussion at last month’s Mennonite Church Manitoba leadership seminar. MC Manitoba board member Dave Regehr, standing, circulates among the delegates to listen and respond to questions as last month’s annual area church meeting. The Wiens family of Abbotsford enjoyed a unique family vacation at Camp Squeah last summer and plan to attend again this year. On a hot summer day last summer, Lisa Cressman, left, Christina Wilkinson and Camille Martin, staff members at Hidden Acres Mennonite Camp in southwestern Ontario, cool off by being the target of water-filled sponges. Sagamace Bible Camp, operated by Nordheim Mennonite Church in northwestern Manitoba, had to cancel its program last summer due to flooding, but hopes to be up and running in 2012. Julia Spicher Kasdorf, the Rod and Lorna Sawatzky Visiting Scholar, spoke to staff and students at Conrad Grebel University College and members of the public last month. Émilie Durville (Claudel) and Marcin Kaczorowski (Rodin) dance in Peter Quanz’s ballet Claudel/Rodin at Les Grands Ballets Canadien in the fall of 2011. Kayla Thiessen, right, with a fellow Serve Nazareth intern wear period clothing for their work at Nazareth Village. 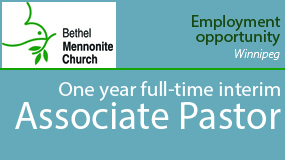 Thiessen’s service experience resulted from a Mennonite Church Canada advertisement in her church bulletin. Bokayo Kanchoro collects water in Berena, Ethiopia, from an underground system filled with Oxfam tankered water. There are 3.2 million Ethiopians affected by the current drought and food crisis. Cheryl Pauls takes over as CMU president on Nov. 1. Concerns of Indigenous Peoples were one of the topics for the International Ecumenical Peace Convocation in Jamaica, 2011. ACNA Archbishop Robert Duncan welcoming them back into the fold. Fernando Enns of the Mennonite Church in Germany speaking at the IEPC in Kingston, Jamaica, 2011. The US government says 29,000 children under five years old died between May and July 2011, according to a BBC report. Lay up treasures . . . or buy an iPhone? During a lunch gathering on their last day at AMBS, Irene and Robert J. (Jack) Suderman reflect on 40 years of ministry. A prevailing theme, Jack noted, is the important role of the church in the lives of Christians and in the world. ‘The peoplehood of God is the primary strategy God wants to use to heal the world,’ he said. Shaun Loney, executive director of Building Urban Industries for Local Development, at the microphone, addresses a Nov. 8 rally in Winnipeg against the federal government’s crime omnibus bill. A plaque marks the Mennonite tree in the Luthergarten, in Wittenberg, Germany. South African President Jacob Zuma: "But our roots are Christian and they will shine through whatever our present problems." $4 million heifer of 2011. Sandy Keomany, left, Venus Moungsouvanh and Joanne Sou perform a traditional Lao dance at the amalgamation service of Lao Canadian Evangelical Mennonite Church and Toronto United Lao Mennonite Church. Willard Metzger, MC Canada’s executive director, spoke to federal MPs and senators about climate justice earlier this year before heading to the 2011 United Nations Climate Change Conference in Durban, South Africa. The story of Muslim and Christian women working together on a quilt at Floradale Mennonite Church (Ont.) 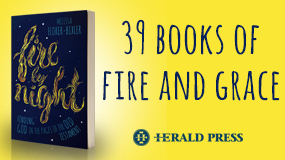 is one of several inspiring but obscure stories revealed in Waging Peace Muslim and Christian Alternatives. The quilt eventually found its way to Palestinian refugees. Clinton commits $3 million to seed Global Equality Fund. Mayan Ixhil community members protest outside the Catholic church in the town of Cotzal after ENEL representatives failed to show up for a scheduled August 2, 2011 negotiation session. Photo by Yasmin Méndez. MCCO supports the growing plea for a sustainable housing plan in Attawapiskat and other remote First Nations. --MCCO Photo by Lyndsay Mollins Koene. Pat and Rad Houmphan, with the congregation of Living Water Church in Borabu, will use the money to assemble care packages. Instead of dragging their cook books around with them on Mennonite Disaster Service assignments, Anne Friesen, left, and Tina Heppner, of Altona, Man., use their laptops to look up recipes and keep in touch with their grandchildren. Mennonite Savings and Credit Union gave Mennonite Central Committee Ontario a half-million dollars towards its new $12 million complex in Kitchener, Ont. Anders Behring Breivik is being held in custody charged with mass murder. During a lunch gathering on their last day at AMBS, Irene and Jack Suderman reflected on forty years of ministry. A prevailing theme, Jack noted, is the important role of the church in our lives and in the world. “The peoplehood of God is the primary strategy God wants to use to heal the world,” he said. The GCF Committee. Anne-Cathy-Graber, MWC representative, is on the far right. Palmer Becker using the 12 disciples model. The Central Manitoba Youth Choir under the direction of Liane Ouimet performs at the Oct. 15 Musical Growing Project at Westminster United Church, Winnipeg, Man. Former Mennonite Church Canada Witness worker Jeff Warkentin passed away at the age of 32 following a brief struggle with meningitis. Posing under one of the trees Peter W. Rempel planted more than a century ago are nine extended family members: Jake and Sharon Krahn, Kevin Krahn, Susan Rempel, Helen Krahn, Cynthia Krahn, Shane Krahn, Matthew Krahn and Justin Krahn. New Order Voice columnist Aiden Enns washes the feet of Kenton Lobe in downtown Winnipeg, Man., on Sept. 24 during a protest against climate change brought about by the West’s reliance on oil. Jim Cornelius, executive director of the Canadian Foodgrains Bank, thanks Beverly J. Oda, minister of international cooperation, for providing a further $125 million over the next five years to help feed the world’s hungry people. Steven Fletcher, the federal transportation minister, centre, announces $3.5 million in government funding for a project CMU professor Kirit Patel, right, will undertake in Asia. CMU president Gerald Gerbrandt looks on. Eleanor, left, and Larry Miller are all smiles as they accept a gift of love for their 21 years of service at MWC from Andrew Reesor-McDowell (center), moderator of Mennonite Church Canada and Bert Lobe, North American representative for MWC. Castle and Reformed church of Trachselwald. For the Bernese Anabaptists it was a century-long expression of unholy alliance. Carol Ann Weaver composes Kgalagadi Calls in Durban, South Africa, this spring. Can ‘free’ speech be ‘hate’ speech? Devotees use towels to touch the face or hands of the image of Jesus during the Black Nazarene procession. The towels are later used to anoint the sick. Marc Ediger (back to camera), a lieutenant with the Reedley (Calif.) Police Department, describes preventive and restorative approaches to public safety. Others pictured left to right are: Mary Fast, mayor of Reedley; Carol Chodroff, Sheri Plett Wiedenhoefer, director of West Coast MCC; Joe Garza, Reedley Police Dept. Talking restorative justice in Washington, D.C.
MCCO will combine two current, overcrowded Kitchener and Waterloo thrift shops into one large and innovative shop in an excellent retail location. James Miller taught biology at the college since 1980. Leymah Gbowee. Only 11 other women have won the peace prize in its 110-year history. About 3.5 million Muslims live in Germany, making Islam the second largest religion after Christianity. Ron Penner served CBC as president for five of his 14 years with the college. John Wiens reflects on his experiences after 46 years in the field of education. He has just retired as dean of education at the University of Manitoba. Susan Schultz Huxman, new president of Conrad Grebel University College, is pictured in the entrance to her new office. A Christ-figure for a new generation? Margaret Fehr, left, and Jinhee Paik are from different worlds, yet have found family with each other at First Mennonite Church, Calgary, Alta., through their shared love of children. Dan Loewen, worship and creative arts pastor at Level Ground Mennonite Church, Abbotsford, B.C., contemplates new ways to incorporate multi-media into church ministries. The scrolls are most commonly made of animal skins, but also papyrus and one of copper. They are written with a carbon-based ink, from right to left, using no punctuation except for an occasional paragraph indentation. Rev. Suheil Dawani heads up The Episocal Diocese of Jerusalem which covers Israel, Jordan, The Palestinian Authority, Syria and Lebanon. Ten combines harvested 80 acres of canola near Elm Creek, Manitoba on Friday, September 16. Kelsey Hutton, 23, and her team has spoken to more than 4,000 people since the election has been announced. Amy Dueckman overcomes her fear and discovers newfound courage through the thrill of skydiving. Nicole Tiessen sits in the sample room in the design studio of Aodbt Architecture + Interior Design in Saskatoon, Sask. Ray Koop, CEO for Bethania Group, and Ferdinand Funk, chaplain at Bethania Personal Care Home, stand in front of the Bethania facility. In 2012, the present "blue" Worship Hymnal will be 20 years old. It contains 668 hymns. 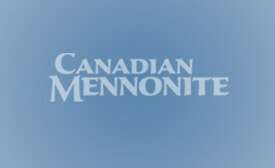 What songs will Mennonites sing? Should to Shoulder formed following debates over an Islamic center near the former site of the destroyed World Trade Center in lower Manhattan and a Florida pastor's threats to burn the Quran. Publishing building sold in Scottdale, Pa. Participants in the SDA-MWC conversations (left to right): William Johnsson (SDA co-chair); Tom Yoder Neufeld (MWC), Robert (Jack) Suderman (MWC); Danisa Ndlovu (MWC); Henk Stevers (MWC); Valerie Rempel (MWC); Teresa Reeve (SDA); Patricia Urueña (MWC); and John Graz (SDA). Missing are: Denis Fortin (SDA); Bert Beach (SDA); Gary Councell (SDA). Emerging adulthood . . . or ‘screwed generation’? Gordon Kaufman was a conscientious objector during World War II. Ahada Kusoco Hassan, 23, cooks breakfast for her family in the Dadaab refugee camp in northeastern Kenya. A typical ration for one adult for one day—as outlined by the World Health Organization—includes 460 grams of cereal, 50 grams of pulses, 50 grams of oil and five grams of salt. An MDS work crew cleaned up a house fire site in Grey Highlands. Former MDS volunteer Les Sheffer (from left), homeowner Stan Baldwin, Mailhoit Trucking driver Chris Beudette, Stayner BIC member and heaving equipment operator Al Avery all helped MDS director Rick Savage with the project. Tutu retired from public life in 2010 at the age of 79. A simple meal, some change and a jar can make a difference. The drought is most affecting the children. Rev. Dr Olav Fykse Tveit was elected general secretary of the World Council of Churches in August 2009, and took up his new post in January 2010. At the time of his election, Tveit was the general secretary of the Church of Norway Council on Ecumenical and International Relations (2002-09). Drought has plunged East Africa into the worst food security crisis Africa has faced in 20 years. More than 11.5 million people are currently in need of food aid in Djibouti, Kenya, Somalia, and Ethiopia. Henry Paetkau has completed his term as president of Conrad Grebel University College. To help people of Kenya affected by the drought and food crisis, MCC will support food-for-work programs similar to the one these Kenyan men and women are working on. Sand dams help to conserve water that can be used for irrigation during the dry season. Anna Marie Geddert, right, director of community ministry at Jubilee Mennonite Church, Winnipeg, Man., works with members of the J Club to make trees and learn how to care for them. After 20 years of service as children’s choir director at Sargent Avenue Mennonite Church, Winnipeg, Man., Lori Wiebe gets to sit back on May 8 and enjoy an encore of songs from past musicals she has directed over the years. Pictured at right is Mel Braun, who is also leaving his post as accompanist after 11 years. Kevin, left, Dave and Dennis Neufeldt are pictured in front of bear-proof bins outside of their Haul-All/Sure Flame shop in Lethbridge, Alta. Cobus van Wyngaard, a pastor from the Dutch Reformed Church, left, and Mpho Putu, a pastor at a Vineyard church in Soweto, participate in the inaugural theological forum put on by the Anabaptist Network in South Africa. Both are members of the network’s steering committee. The Bible school students of 1964 take their turn doing the dishes at lunch. Sudan's enormous humanitarian needs follow many years of inequitable development, marginalisation and internal conflicts that have displaced over 6 million Sudanese, including 2 million in Darfur and 2 million in the South, and left many destitute. Jesus Radicals and others replace the American and U.N. flags on the campus of Goshen College with the Agnus Dei and Earth flags. This was a protest against the college's decision to play the national anthem a year ago. Martin Junge is the first Latin American to hold the office of general secretary..
During a two-decade period of brutal dictatorship, in 1979, Brazilian church workers and dissenting lawyers found a loophole in the legal system allowing them to gather evidence of atrocities and other abuses committed by the military regime. How involved should we be in politics? Mr. William, far left, owns Moriya Fruits Shop in Ishinomaki City, Miyagi Prefecture. His shop has been reclaimed from tsunami damage and is again open to serve the community. Also pictured are (l.-r.), Willie Reimer, MCC; Takeshi Komino, CWS; Shingo Kobayashi, who heads CWS’ implementing partner organization in the city; and volunteer “Dancho." Bishop Munib Younan: "Popular uprisings in support of democracy in Northern Africa and the Middle East should be an important opportunity for churches in Arab countries." Coptic Christians protest against violence by Muslims. Rev. Margot Kaessmann told a Bible study she believes that a suggestion to pray with the Taliban by candlelight is "a much better idea than bombing water tank lorries in Kunduz." Elsie Rempel and her granddaughters Johanna, left, and Sophia, right, pose through their vehicle’s windshield on a summer vacation last year. St. Clair O’Connor residents Julia Bringau, Jane Huggins, Mae King, Joyce Cockburn and Doris Cullen enjoy the community’s tea room, a place where residents and the public can enjoy a drink or shop for gifts. Although The Liptonians are not a religious band, singer-guitarist Bucky Driedger, left, says his Mennonite heritage has influenced the way he writes the band’s lyrics. Tavis Weber checks on loaves of fresh-baked whole-grain whole-wheat bread at the Golden Hearth Bakery he owns with his wife Heidi in downtown, Kitchener, Ont. Six graduates from Canada, are, from left, Alicia Buhler, Virginia Gerbrandt, Mark Tiessen-Dyck, Miles Reimer and Carrie Martens; Christine Kampen graduated in absentia. Photo by Steve Echols. Al Hariri (above) has refused to support the appointment of Hezbollah-chosen Najib Miqati as the new prime minister. Young Anabaptists (YAB) helping to decide are (l to r) Melani Susanti, Indonesia; Tigist Gelagle, Ethiopia; Rodrigo Pedroza Garcia, Mexico; Kristina Toews, Canada; Sumana Basumata, India, and Carlos Alberto Alvarez Woo, Colombia. Seated are Adi Walujo, Indonesia; Edgardo Sanchez, Argentina; and Sandra Campos Cruz, Costa Rica. Disaster recovery studies graduate David Barker, second from right, poses with, from left, CMU president Gerald Gerbrandt and instructors Lois Nickel and Kenton Lobe. A girl is carried away after the shooting spree. Bill Warren from Baptist Theological Seminary, New Orleans, leading the study. Katharine Jefferts Schori: "the reign of God lies in the direction of more porous borders." EMU professor Lisa Schirch with Pakistani graduates of EMU's masters program in conflict transformation, Ali Gohar (l.) and Jennifer Jag Jivan (right). Addition completed in time for Conrad Grebel's 50th anniversary in August, 2013. Residents of Aura in the Afar showed North American farmers on a food study tour to Ethiopia reserves of sorghum in their homes thanks to agricultural support and irrigation. Child soldiers are regularly used in conflicts such as that in Sri Lanka. The crowds were treated to not one, but two kisses by the newlyweds. Haitians and Canadians mingle in a joyful dance in the Haitian village during a recent production of Iron Will in Waterloo, Ont. Steve Shenk, succeeding John Longhurst as director of marketing/sales for MPN, has been the executive director for Valley Brethren/Mennonite Heritage Center, Harrisonburg, for the past 7 years. He has also worked in public relations for Bluffton College and EMU, as well as managing editor for Gospel Herald, now The Mennonite. An employee of the APPBOSA co-operative prepares bananas for shipping to customers in Europe and North America. Colin Firth stars as Prince Albert/King George VI in the Academy Award-winning film, The King’s Speech. MDS volunteers Dave Friesen and Eric Penner examine the drywall finishing work they are completing. Area church youth minister Anna Rehan and area church minister Jerry Buhler light candles during the memorial service at this year’s annual general meeting in North Battleford. ‘Mary With Tears,’ a sculpture of Mary, the mother of Jesus, by Vilius Orvidas, who did most of his work under the Soviet occupation of Lithuania. He died in the early 1990s. Photographed by Jerry Holsopple, a visual and communication arts professor at Eastern Mennonite University, Harrisonburg, Va.
From four to six students utilize one computer. The author, Bryan Butler (center) sits down to a delicious fish fry with Jose (Chepe) Vasquez (left), chair of the local co-op, and Manuel Tobara, general manager of the local housing program. It was a reunion of friends when Sibusiso Ndzimandze, a peace educator from Swaziland, stayed in the home of Gord and Lynne Ball during a recent 10-day visit to Ontario. Now no longer hosting classical radio shows or conducting the Grand Philharmonic Choir, Howard Dyck enjoys his leisure time at his Waterloo Region home. Rob Yost of Hillcrest Mennonite Church stands at the base of the congregation’s one-kWh photovoltaic solar-energy system. At the annual delegate sessions of Mennonite Church B.C., Camp Squeah staff members Tim Larson, Geoff Gould and Rob Tiessen present a skit about camp ministries. 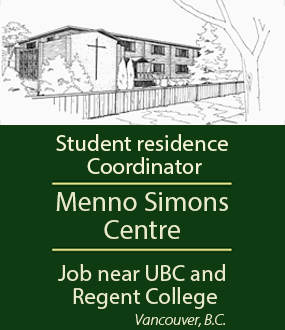 Expanding ministries in MC B.C. Henry Kliewer, standing, the director of Mennonite Church Manitoba Leadership Ministries, offers a prayer of blessing during the commissioning serv-ice for Ken Warkentin, the new executive director for MC Manitoba. “I am looking forward to the significant challenges that lie ahead,” said Warkentin, who has been involved in church work for 29 years. Silver Lake Mennonite Camp’s dining hall was gutted by fire on Feb. 7. Camp director Dave Erb hopes to have a refurbished or new building set to open by June. Campers who play stringed instruments—including Saskia van Arrangon, Jordan Klassen and Daniel Penner, pictured—as well as brass, woodwinds and piano, or those who sing, are all welcome at the Ontario Mennonite Music Camp, held each summer at Conrad Grebel University College, Waterloo, Ont. Archery is one of the many activities offered by Camp Squeah that can be enjoyed by all age groups at this summer’s inaugural family camp. Canoeing is one way Hidden Acres Mennonite Camp gets campers to understand the need to nurture creation. Hank Friesen has followed his life’s passion, working in the funeral business in his retirement years. Protesters at the Let Them Stay rally picket the office of Vic Toews, federal minister of public safety, in hopes of setting up a meeting to discuss the deportation and incarceration of American war resisters. Michael Bueckert, holding the Peace Alliance Winnipeg sign, right, protests as a representative of Project Peacemakers. Canadians can help fill the shelves of the Anabaptist Network in South Africa Peace Library and share Anabaptist theology across South Africa by donating books and resources to the cause. Mennonite Church Canada Witness worker Karen Suderman, right, chats with Ladysmith women who are committed to feeding hundreds of South African children each day. The WDP Committee in Chile sees the theme question, "How Many Loaves Have You? ", as an invitation to enter a process that draws us into the Bible, into the context of Chile, and into the real situations of our lives and communities. This year's Bible studies come from 1 Kings 17: 8-16 and Mark 6: 30-44. A women's literacy class, one of many sponsored by MCC in Malaway in upper (southern) Egypt and run by the Coptic Orthodox Church there. World Vision's Jeff Wright: "We need to take this seriously." Are American clothing donations really needed? Anabaptists from the southern countries of South America worship at their 14th biennial gathering, held in San Bernardino, Paraguay, January 26–30. Photo by Tim Froese. Wes Epp has chaired the Drake growing project committee since its inception in 1998. Israeli occupation authorities on Feb. 3 bulldozed Palestinian land in occupied Jerusalem's town of Issawiye and destroyed a water well, eyewitnesses reported. Christy Anderson, second from the left, shares her experience at Canadian Mennonite University with fellow students. Solar Grebel students are thrilled to watch their green dreams take shape as they stand on the roof at Conrad Grebel University College with a partially installed solar thermal collector. Victoria Neufeldt works on The Historian, a publication of the Mennonite Historical Society of Saskatchewan, from her home office. Patrons at Sam’s Place in Winnipeg, Man., enjoy coffee, reading and good conversation under the watchful eye of ‘Sam,’ the Komodo dragon. The formerly independent, community-based, non-profit organization is now a part of Mennonite Central Committee (MCC) Manitoba and the board that ran it now acts in an advisory capacity. Frank O’Dea, a former homeless panhandler on the streets of Toronto, Ont., who went on to found the Second Cup chain, told MEDA convention participants in Calgary how to ‘unleash’ their entrepreneurship potential. Regehr (center holding medal) is flanked by Their Excellencies the Right Honourable David Johnston, Governor General of Canada, and Mrs. Sharon Johnston, Nancy Wildgoose (left) and Nancy Regehr (right). Photo by Sgt Serge Gouin, Rideau Hall. The Harms’ golden wedding anniversary celebration took place on June 19, 2010, at the Lowe Farm Community Centre, Man. Josie Winterfeld, missions, peace and justice worker at Stirling Avenue Mennonite Church, Kitchener, Ont., participates in the ‘die-in’ during the annual peace protest outside of the former School of the Americas at Fort Benning, Ga.
J.M. Klassen at the MCC offices in 1983. John Calvin (1509-1564), whose followers developed Calvinism. Ying Ying Wang of China and Santiago Gomez of Colombia sport both poppies and MCC peace buttons at the Remembrance Day service in Warman. Yemiru Tilahun, mission and evangelism director of Ethiopia’s Meserete Kristos Church, right, with two leaders of the Emmanuel United Church of Ethiopia. Emmanuel vice-president Samson Mariam, left, and president Bezalem Fisseha, centre, were mentored by Meserete Kristos leaders. Noko is the first African to hold this position; as convener of the important new initiative Inter-Faith Action for Peace in Africa he brings a profound understanding of the multi-religious African continent and is a key voice of Christian leadership. J. Lorne Peachey (left) was often heartened by the gifts of Swiss chocolate that Markus Rediger (right), of Switzerland, left at his table during MWC executive committee meetings. Howard Zehr, 2nd from left, in late November with German Mennonite Peace Committee members and others involved in honoring Zehr for his restorative justice work. The group is visiting a stone memorializing the martyrdom of Anabaptists Michael and Margaretha Sattler in Rottenburg am Neckar, Germany. Dr. Sue Johnson does pre-conference training. Willard Metzger began his duties as general secretary on Nov. 1, 2010. What angers residents the most is that they were not consulted. Dave and Karen Mast have traded their home in Ephrata, Pa., for a trailer that they take with them on their assignments with Service Opportunities for Older People (SOOP), a Mennonite Mission Network ministry. Lao Canadian Evangelical Mennonite Church youths welcomed guests to a fellowship meal following a grand opening celebration for the congregation’s new worship space at a mall in northwest Toronto. Jake Rempel and Brian Wiebe prepare a hole to plant one of 37 trees that will border the Carman Mennonite Church property on three sides. About half of the funding came from Manitoba Hydro’s Forest Enhancement Program. Reuters – Pope Benedict XVI waves at the end of the Consistory ceremony in Saint Peter's Basilica at the Vatican. Rudy Wiebe signs copies of Collected Stories/1955-2010 at a Nov. 10 book launch. MPN’S Sunday school curriculum, currently includes tips for teachers and a downloadable Power Point presentation about how to use the curriculum. “Are we satisfied the process has been a healthy one?” MC Canada moderator Andrew Reesor-McDowell asked the General Board members.